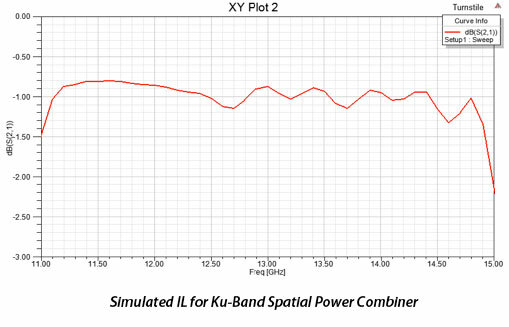 A lot of communications systems, radar and imaging applications span­ning Ka-band through W-band (26 to 110 GHz) require transmitter output powers in the range of a few watts to a few tens of watts. Ampli­fiers using vacuum-tube have long been available, to pro­duce output power from 10 watts to over a kilowatt. These tubes, especially TWT, are not readily mass-produced, and are not cost-effective on a money-per-watt basis when only tens of watts are needed. In addition, vacuum-tube amplifiers usually require heavy mechanics, in comparison to solid-state amplifiers, and graceful degradation of these last makes them preferable to vacuum tubes in many applications. In this document we report the state of the art for microwave medium power amplifiers, let us say from some watt to 100W. We first describe the state of the art of solid state power amplifiers or hybrid vacuum_tube-SSA, regardless the application to waveguides. Then, we will concentrate our attention to solid state amplifiers mainly dedicated to be integrated in waveguides. In fact, when the number of active elements increase over some limit, 10 to 15 usually, the power multiplication factor, i.e. 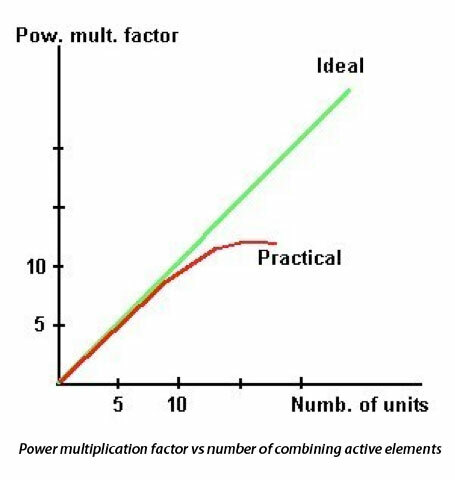 the number we have to multiply the power of each single combining element to obtain the output power, decreases very rapidly. In addition to Ohmic losses in the splitters and combiners, other causes of losses are the phase and amplitude mismatches among the elements, which increase loss significantly, and typically the power multiplication factor is limited near 10. After such number, Spatial Combiners have the dominance in SSPA. “Spatial” or “Quasi-Optical” combining technique (SPC or QOC) provide an alternative method to combine the outputs of a large number of solid state devices. This technique is illustrated in the following figure . 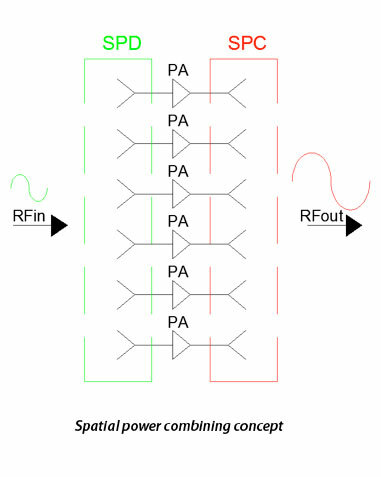 Spatial power combining provide enhanced RF efficiency by coupling the solid state device to large-diameter guided beams or waveguide modes, rather than using planar transmission line combining structures. Using a large beam cross section allows the outputs of many devices to be added together in a single stage of combining. All of the elements are essentially operating in parallel, and the loss is roughly independent of the number of elements, allowing large numbers of devices to work together efficiently. Ohmic losses in these systems are minimal since the energy is distributed and combined in air via low loss waveguides or Gaussian beams. Most of the losses in these systems are associated with coupling from the active devices to the propagating beam and subsequently coupling to the output port, such as a waveguide. Losses from both of these processes can be minimized through careful design. Though there is no formal definition, the terms spatial and quasi-optical are usually applied to electronic systems that employ high order beam guiding components (such as Gaussian beams defined by lenses or shaped mirrors, or waveguide systems) for signal distribution and collection. It could be argued that any antenna array, particularly if feeding a large lens or shaped reflector, is therefore quasi-optical. A useful distinction between a quasi-optical system and a classical phased array is that the latter uses circuit-based feed networks to ensure that the array elements operate in phase, whereas a quasi-optical system employs spatial feeds for this purpose. Since many of the so-called quasi-optical systems are packaged in metallic waveguide enclosures, it is best to consider the term “quasi-optical” as indicative of a methodology in which the designer tailors the electromagnetic field profile within a guiding system to both distribute and collect the signals that couple to the individual devices, rather than using transmission lines or single-mode waveguides to couple to individual elements. The quasi-optical advantage grows with increasing frequency of operation, where the shorter wavelengths allow very dense device integration. In addition, because noise from the individual devices is largely uncorrelated, the broadband noise figure of quasi-optical circuits tends to be similar to that of a single device. For similar reasons, the excess phase noise power in quasi-optical systems decreases in proportion to the number of elements. These properties allow an increased dynamic range in quasi-optical receivers. Finally, quasi-optical devices tend to degrade gracefully as devices fail, and are insensitive to the single-point failures that could be catastrophic in other systems. 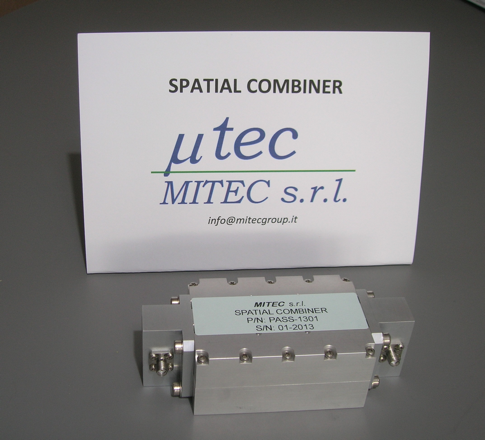 The above SPC is capable to combine 16 MMIC’s if the whole X-Band, with a maximum IL of 1.1dB. For example, using GaN SSPA MMIC with Pout=10W, nearly 130W of mean RF power is available at the output. The above simulation is relative to an SPC combining 32 MMIC’s. Considering to use a SSPA MMIC with 10W of output power, we expect a output power of nearly 255W. 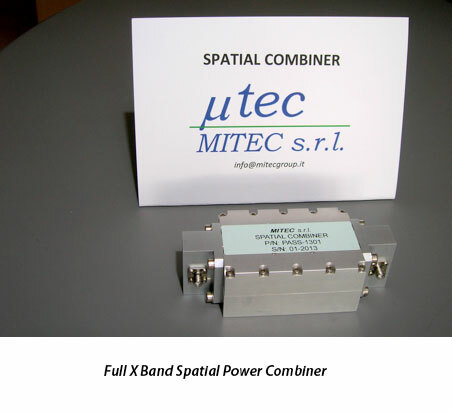 TO DATE OUR PROTOTYPE FOR A 8-12 GHz BAND CAN DELIVER UP TO 500W RF POWER. FURTHER WORK ON OTHER RF BANDS IS CARRIED OUT IN COOPERATION WITH UNIVERSITY RESEARCHERS.